He was speaking last night June 8, 2016 on his Straight Talk show heard on ZBVI 780 AM between the hours of 8:00 PM and 9:00 PM. According to De Castro, he got a chance to go to Tortola Pier Park a few weekends ago. “And I must admit it is beautiful; however, I find it difficult to understand why there are so many buildings and such large buildings...Why are there so many businesses and such exorbitant rent?” he asked. “I personally feel a better West Indian architecture or Virgin Islands architecture could have been designed. But apparently their intention was to destroy the businesses on Main Street and Waterfront Drive,” he said. 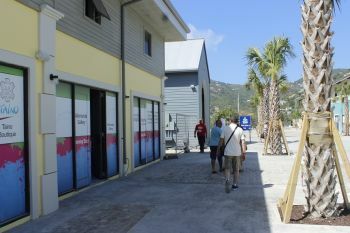 De Castro noted hearing many times from the Minister for Communications and Works Honourable Mark H. Vanterpool (R4) and the City Manager Janice Brathwaite-Edwards about what they are doing for the Virgin Islands' capital city of Road Town. So they constructed Sodom and put it out on wickhams cay and leave old RT as the Gomorrah of the Virgin Islands. But wasn't both Sodom and Gomorrah destroyed?? Where is the City Manager waste op f dam time. Donald go with a clipper and clip/cut from where the vine come up out the ground and it will dead. Stop complain and help out the society, Ok one hand don't clap. I have been calling for protection of main street for years. This is the heart and soul of Rode Town as a reflection of culture and heritage. I too have visited TTP and consider it an extension of St Thomas. There is no activity unless there is a ship in. Several stores from main street have moved down leaving Main st vacant. I suggested at one point to have community groups clean and paint (with donated left-over paint from the stores) and create a programme where new entrepreneurs could get a start renting smaller spaces in partnership with government and owners. This is a perfect space to do it. Even the previous city manager had vision to protect the history of the street, turn the old post office into a boutique hotel, move the police station upstairs and create a cafe downstairs on the plaza. This right opposite the ferry dock! Main St should be a pedestrian way anyway, to promote community and tourism. Tours and brochures and plaques could be researched by students as a school project on history to give tourists a sense of place. Mr. Decastro is so right! And those of us who were paying attention predicted this abandonment years ago. What is the role and responsibility of the City Manager position? Is the City Manager position empowered and adequately resourced to do what? Is it redundant and a make believe job with little to no power, influence or value. The new and olde can co-exist. Tortola Pier Park is the new; Main Street, the olde. Main Street should be designated a historical district with the buildings put on a historical register. The architecture, buildings......etc should be maintained, repaired........etc to match as closely their period of construction. Main Street can be a part and parcel of heritage tourism. The olde has value. Many of us may have visited the Coliseum or the Pantheon. Is it not a good thing they were not razed. Help me out here if you can. Don't these buildings on Main Street have owners? Are you if the opinion that the government should issue a contract for the removal of vines from privately owned properties? Finally, what gain would it be for the government if Main Street businesses were to collapse? Perhaps Mr. Decastro can address these questions on his next radio program. tourism is our greatest revenue, how do u think this would look to a tourist? property owners should be mandated to maintain their properties because they are the public face of BVI. They don't want to see their properties rot away (unless they are holding out for tearing down in order for tall modern buildings which would ruin any sense of BVI). This is what is happening world wide. Figure out a way to protect history with incentives for the owners. The old prison/museum project died with the former contractor. The last time i saw action man on main street he was walking up and down campaigning with a senorita. Electricity is responsible for cleaning the vine on the wires and cables, the owners of the buildings responsible for cleaning their buildings. We need to stop expecting and blaming the blinking government for every damn thing when we ourselves can use the time we take to complain and help to keep the city clean. Ask not what your country can do for you. See what you can do for your country. We all live here. I am sick and tired of some of us Tortolians and even the blinking ExPats who on time and have the bloody worst things to say about a country that's helping you live your best life yet and get a roof over your head back home. Get with the program and stop criticizing. PUT UP OR SHUT THE HELL UP. I swear if an expat is not mentioned in a comment that is totally unrelated to them people would not feel good. Mr. DeCastro made a comment address the reply to him or to the comment. Vines got a trade license for dat? What is your role here. Can't you cut the vines too? Be a good citizen, please? You can't maintain a property unless it brings in enough rent and you can't ask enough rent unless the trade is there for tenants to make a profit. Main Street's problem is the same as many US city centers when giant shopping malls open outside town. It takes agressive effort to restore the city center to prosperity. First you have to get the visitors off the pier and into town. The original plan had a great idea that was promptly killed by the taxi drivers. A free tram that ran from the pier all through town dropping off and picking up visitors so they spread their spending around. Exposed to more options visitors tend to spend more money than they would on a 2 hour bus ride. Unfortunately, this is typical of the BVI as a few politically connected groups can demand all the goodies. Most People expect everything from the Government and nothing from themselves. If they have a business that is not doing well, it's the Government fault, it is not the poor goods and services they provide.